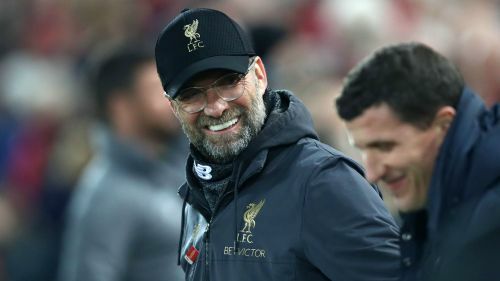 Jurgen Klopp has made light of Liverpool's gripping Premier League title race with Manchester City, joking that he does not "get a heart attack" whenever he hears the defending champions have won. Table-toppers Liverpool had drawn three of their previous four league games but returned to form in style against Watford on Wednesday, crushing the Hornets 5-0 at Anfield. Braces from Sadio Mane and Virgil van Dijk, together with Divock Origi's first league goal since December, secured an emphatic victory for the Reds, but their lead at the summit remains just a point after City beat West Ham 1-0. Klopp insists he is only focused on his side's results and cannot be surprised whenever Pep Guardiola's men pick up victories. Asked for his thoughts on City's defeat of the Hammers and the title race, Klopp told a media conference: "I don't think you need an answer from me. We only need to play football and to win games then we will see what happens. "It's not like I go in the dressing room and someone tells me the result and I get a heart attack. It's a normal thing. If you are top of the table, it's pretty likely that all the contenders win. That's how it is. I didn't think about City but it is of course what I expected." Klopp was understandably delighted with his team's display and said he had paid little notice to questions over Liverpool's recent form, following goalless draws with Bayern Munich and Manchester United. "I am pleased of course. It was exactly the game we wanted," he said. "In a game when you win 5-0 and everybody performs on a really high level, and still you have to say both your centre-halves had an outstanding defensive game, the goalkeeper had to make two outstanding saves, then you see the quality of the opponent. All the rest in the game was exceptional. "The crosses were the most obvious thing because they were really brilliant, positioning in the box, heading, all the other things, the runs, the direction, the desire, the composure. Tomorrow is another day, we have to deal with all the other things but for today that was a fantastic football game and I'm really happy for the boys because they deserve it so much. "We draw against Bayern and against United and everybody talks about, I don't know exactly what they are talking about, but things I don't understand. It's always about showing reactions, but not reactions of the things we are talking about. "We wanted to play like this every day. That is maybe sometimes possible, sometimes a bit less, but you have to be stable and the boys were always stable and really fluent offensively. It is good. It is a good example of how football should look. Let's try to do it again and again." Watford boss Javi Gracia accepted Liverpool were vastly superior and full value for their dominant win. "We knew before the game they play really well. It was difficult for us," he told the BBC's Match of the Day. "We have had good performances lately but today they were much better and deserved their victory. "They opened the game very early and afterwards they dominated. We had a few chances in the second half to score and we didn't take them. Maybe one would have changed the game but it wasn't possible to have options."